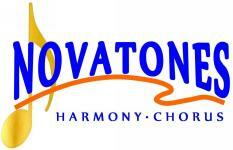 The Novatones Harmony Chorus is pleased to have the hugely talented Peter Donald as our Musical Director. Peter has been playing and teaching music for most of his life, starting with his first violin lessons at 6 years of age and then branching out to violin teaching at the tender age of 15. Upon matriculation, he naturally chose to study music at university with a major in Performance and then taught at the Conservatorium of Music. Peter has had wide exposure to various forms of musical expression, having directed many orchestras and choirs over the years, but it wasn’t until 2013 that he “got hooked” on the Barbershop style of a Capella singing. And he has rarely been quiet since. As well as directing the Novatones, Peter also sings in the well-known "Highjacked" men’s quartet, and in the mixed quartet in "Accelerando" with his wife and two daughters. And he still plays a very mean electric violin at every opportunity!